I was looking at the latest issue of Woodcraft magazine and there was an interview by Gary Rogowski. They published a Q&A profile and I really appreciated this quote “When you realize that errors ultimately guide you toward better work, you learn to handle failure in a positive manner.” Often I struggle with that! I will admit to looking at the very intricate and detailed projects on LJ and reflecting that I wouldn’t even know where to start. With a mindset of learning from my errors… well I have a lot of errors… who knows what I can accomplish! Definitely learn from each project – both the aspects that worked out as well as those that needed a little “correction.” That quote may just need to get posted in my shop to help me from getting too down on myself when the inevitable errors occur. And I’ll keep looking at all the great posted projects here on LJ for inspiration! Very profound. If not for errors, I’d never finish a project. I do believe it was the errors that dictated the design elements of the four Prie Dieux I built over the last three years. Yours are examples of the projects I cannot imagine attempting! 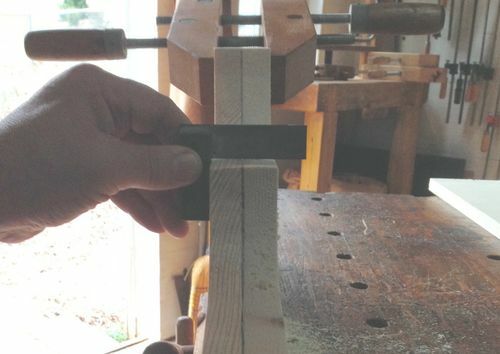 Knowing that established woodworkers also face errors, which become part of the design, is encouraging. I appreciate how you share the process in your blogs. Very profound. If not for errors, I d never finish a project. I do believe it was the errors that dictated the design elements of the four Prie Dieux I built over the last three years. I think the sign of a good woodworker it how they recover from an error. We all make them and you can’t let them set you back. Find a way to correct it and travel on to the end of the project. The errors all teach us something and it is best if we can learn from someone else’s errors but if they are yours and you share what happened, you can help the next guy/girl!! I used to have guys working for me, sometimes I would see them doing something wrong, instead of flat out telling them it was wrong I would wait until they made the mistake because I knew they would learn better than just me saying it. The mistake cost me, but I saw it as investment to better my employee. Thank you, but don’t sell yourself short! Nothing should be beyond attempting … beside that’s how we master errors … right? I’m glad you enjoy my blogs. Definitely. I appreciate the project descriptions that give background on the process…including corrections from original plans. I think the sign of a good woodworker it how they recover from an error. We all make them and you can t let them set you back. Find a way to correct it and travel on to the end of the project. The errors all teach us something and it is best if we can learn from someone else s errors but if they are yours and you share what happened, you can help the next guy/girl!! Making a mistake does help alert the mind to avoiding the same situation in the future…at least most of the time. Sometime I get more than one learning opportunity!! I should have a Doctorate in making mistakes and having to fix them. I totally understand this. I watch various videos and see “perfection” and then get frustrated when my process isn’t so smooth. I do sometime wonder how many pieces end up discarded before the picture/video sequence that is puplished. I appreciate the instructional dvds that I have that show some minor “redo” segments to dial in a cut. A little reality which is very helpful when learning! ... I just knew that was square!